Vacations are good for us. Studies show that vacations make people more productive and reduce stress — which is very important, as stress can be very unhealthy to have. But when it comes to vacations, more than a few of us are guilty of indulging our unhealthier sides during our time off; eating and drinking things that we normally wouldn’t while exercising less than we normally would. For the healthiest vacation possible, a bit more attention should be paid to what we consume and what we do when we’re traveling. Healthy living includes eating well. This means that whole, unprocessed foods — especially vegetables — are key. When it comes to exercising, we need at least a half-hour per day, experts agree. When we work hard to turn these steps into habits, we can create a healthy lifestyle that comes almost second nature. But taking a vacation, of course, means making a temporary change in our lifestyle. The cues and routines that our habits depend on on may change or disappear when we’re on vacation, and that can open the door for a less healthy way of life. While traveling, we may not have room for running shoes in our suitcase. We might not have access to our healthy pantry, and we might eat processed foods in airports or at convenient spots near our hotels. Perhaps we indulge in desserts we might have skipped otherwise (we’re on vacation, after all) and drink a few too many alcoholic beverages. The fatty foods and alcohol that we may take in on vacation are very bad for us, and the lack of exercise means that all of those calories and fats won’t be burned away. None of this means that we can’t have fun on vacation. But it does mean that we’d be wise to plan healthier, more active vacations from the start. Don’t assume that you’ll be active during your vacation if you don’t plan out specific ways to do so. Throwing your running shoes into your suitcase isn’t enough because your habit triggers and other key lifestyle features will be different when you’re on the road. 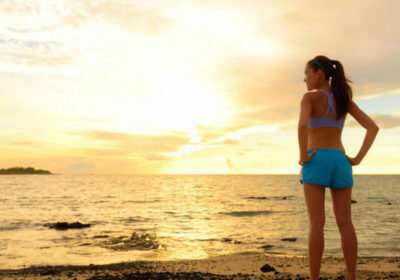 During vacation, you may find it surprisingly easy to skip that morning run. Instead, plan specific active experiences for your vacation and weave them into your overall vacation plan. For instance, let’s say you’re headed to Hawaii. Maybe you’ll run on the beach every morning, and maybe you won’t — but you’re nearly certain to show up for those surfing lessons in Waikiki you signed up for, and that will mean a fun and active day on the waves. Breaking a sweat isn’t a chore when you’re enjoying a once-in-a-lifetime experience on your vacation! Another problem with just throwing your running shoes in your suitcase is that it doesn’t take into account what sort of vacation you’re on. If you’re at the beach, you might prefer to run barefoot; if you’re in a busy city, you might find that it’s a more frustrating place to jog than your hometown is. The best healthy decisions for your vacation will be ones that take into account the type of vacation you’re on. If you’re checking out one of the many great places to see on Florida’s Gulf Coast, consider beach activities. Pack a frisbee or sign up for scuba-diving or surfing lessons. If you’re headed to the big city, plan an urban hike that will take you to some of the attractions you plan to see. Carve out enough time to make sure you won’t need to take a cab instead. In short, tailor your exercise plans to your actual vacation plans! It’s worth planning a healthy vacation. Avoiding a week of binge drinking and eating will spare your body serious damage, and staying active will help you reap the many mental and physical health benefits of staying fit. Just like vacations themselves, healthy living keeps us happy and more energetic. So make your next vacation a healthy one, and come back happier and more refreshed!